Long before cable television, back in the early to mid '60s, dozens of pop and rock stars were filming hundreds of music clips for what amounted to a proto-MTV. It was centered around a contraption, manufactured in France, called the Scopitone 450, which basically was a jukebox hooked up to a 26-inch TV set that played 16mm film clips. The technology had been around since at least the 1940s when "Soundies" -- black and white clips played on coin-operated machines -- were briefly the next big thing in show biz. 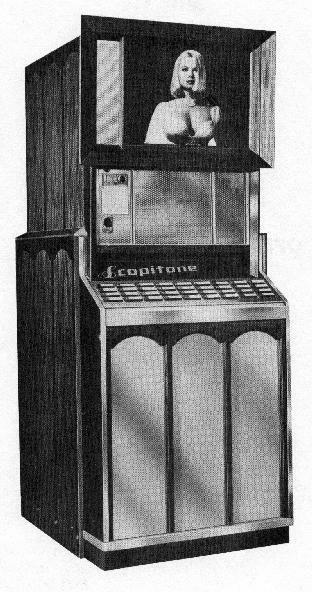 The Scopitone machine was a huge improvement over the old Soundies model, For one thing, a customer could chose among a wide array of film clips. The clips were in color. And best of all, as the art form evolved, most the Scopitone clips were filled with scantily-clad go-go girls whose shimmying put Sister Kate to shame! ... the message in these videos is clear: T&A! The in-your-face sexiness of the images is a stark contrast to the rather unsexy, often downright lame songs. To see more explicit non-static imagery, one would have had to go to the trouble of attending a peep show or tracking down a stag film. The Scopitones' absurdly enthusiastic buxom women were chosen to attract the male gaze on a small screen across a smoky bar, with the promise of a peek at more skin...in the next video. But let's start with one of the milder ones. Debbie Reynolds' production company was responsible for many of the Scopitones. But the bump and grinding is kept to a minimum here -- though wholesome Debbie sure could work her pretty pink petticoats in this Golden Throat take on "If I Had a Hammer." Joi Lansing, one of the queens of the Scopitones, sings one of my favorite songs from a Matt Helm movie.